The word asante means thank you in Swahili. Our Asante Supper is an evening to celebrate the tireless commitment of our supporters and partners, without whom Touch’s impact would not be possible. 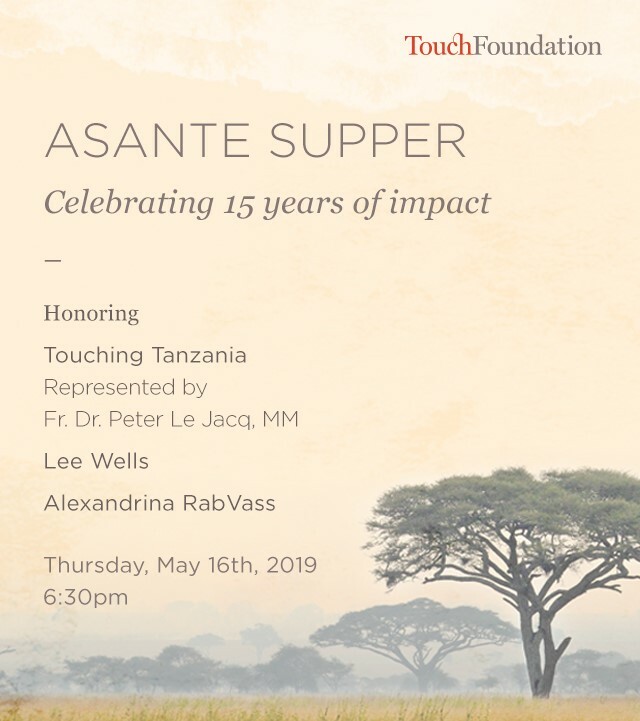 The 2019 Asante Supper at the Lotte New York Palace will celebrate Touch’s 15th anniversary by honoring the dedicated alumni who helped Touch establish deep roots in Tanzania and grow into the impactful organization it is today. Please contact Kira Elbert, Chief Development Officer, at kelbert@touchfoundation.org or 646-573-8318, for more information on purchasing tickets or sponsoring the event. If you are unable to attend the event but would like to make a contribution, please visit our donation page.